(Bonnie Tsui for The Boston Globe) Donna Pacheco, Achadinha's head cheesemaker, in the aging room of goat cheese wheels. PETALUMA — This town is still the kind of farmstead place where, on a winding country road just outside the historic area, traffic stops for a hefty wild turkey hustling across the road, head down and red wattle flying. Today, Rouge et Noir continues to be made by the Marin French Cheese Co. at its Petaluma-based Cheese Factory. The facility has been turning out hand-crafted cheeses since 1865, and is the oldest producer in the country specializing in soft ripened cheeses. I made my way to Petaluma with a carload of friends on a kind of safari to taste the new and old in cheesemaking here. Our first stop was the Achadinha Cheese Co., an artisanal goat cheese dairy and creamery about three miles from the town center. Though the Pacheco family has owned Achadinha — named for a town in Portugal where the family patriarch was born — since 1969, the farm has gone through several iterations. After being a cow dairy for almost 30 years, Achadinha made the transition to goats in 1997. In 2001, it began making its own cheese. The head cheesemaker is Donna Pacheco, a warm, friendly woman who runs the farm with her husband, Jim. Achadinha made its first foray into cheesemaking when Donna decided she wanted to learn how to do it. This spring, the Pachecos installed a cheese production facility on the premises, with a viewing room where guests can watch cheese being made by hand. On our visit, Pacheco ran us through the process of making a batch of Capricious, the farm’s signature aged goat cheese, starting with the pouring of pasteurized milk onto the cooking table; adding rennet and whey; draining and cooling the curds; hand rolling them into neat, tight bundles with cheesecloth; and putting the cheese onto boards to be pressed overnight. The next step comes the following morning, when the bundles of cheese are rubbed down with salt and placed on racks in the aging room, where they are left to grow mold for 30 days. The cypress boards on which the cheeses rest bring in a natural mold and impart a characteristic flavor to the aging cheese — adding “a bit of spice, ’’ says Pacheco. Each wheel of cheese is then rubbed down once a week with olive oil as a protective coating, and is aged six months to a year. As we walked through the aging room, its shelves lined with these voluptous, fragrant wheels, Pacheco pointed out the color differences between each batch. Newer wheels have more of a bluish tinge, while wheels in the middle-age range have turned white. Wheels that have aged at least six months take on an orangey blush and flatten out. Part of being a small-batch artisanal cheesemaker, she says, is that “we’re consistent in being inconsistent, due to all the variables.’’ But the ever-changing conditions make her cheeses uniquely flavorful. Last year, Achadinha turned out 24,000 pounds of cheese, and the farm’s products are sold around the country. Visitors can also observe the twice-daily milkings — a healthy goat produces about a gallon a day — and stroll among the 1,600 goats on the farm. The Pachecos raise La Manchas and Nubians; the latter’s milk is especially desirable for its high butterfat content. Tours and tastings are by appointment. We finished our visit with a tasting of homemade sausage paired with a 10-month-old Capricious, a terrific, nutty, hard goat cheese with some bite. Verging on crystalline in texture, it’s ideal for shaving on asparagus, pizza, or soup, and its salty character goes well with port or a cold beer. Pacheco may have started making cheese only in 2001, but she began earning accolades the very next year when Capricious won Best in Show from the American Cheese Society. Achadinha also produces three kinds of fresh cheeses: a Jack, a creamy feta made with sea salt brine, and Broncha, a mild table cheese inspired by a Portuguese family recipe and faintly flavored by the brewers’ grains fed to the goats. Though Achadinha concentrates more on cheesemaking these days, the farm continues to sell its goat milk to other local cheese producers, including the venerable Marin French Cheese Co., our next stop. Driving through verdant farmland to Marin French, we spotted vivid red-winged blackbirds and turkey buzzards swooping through the eucalyptus trees lining the road. Happily, the bucolic rolling landscapes that Fisher described so warmly in the 1970s still exist. 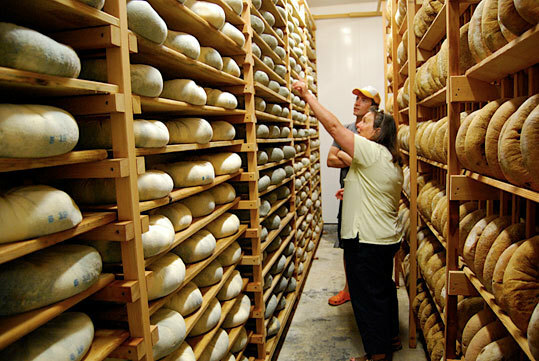 There are plenty of places to hike and picnic, and Marin French, situated in a 700-acre coastal valley with a picturesque duck pond, has one of the most idyllic settings around for sampling dozens of prize-winning cheeses. A rustic wood sign marked with chalk welcomes visitors to the picnic area and waterfront, just past the red-roofed farm building where Marin French produces more than 40 styles and varieties of cow and goat milk cheeses. As always, each cheese is produced by hand, one at a time. A busy general store offers tastings and sells cheeses and picnic supplies. Behind the counter are the cheesemaking facilities, where customers can tour (the company advises that you call ahead). Though Marin French used to milk its own herds in the early years, these days it’s purely a creamery, buying fresh, hormone-free Jersey cow milk from neighboring dairies (and its goat milk from Achadinha). In 2005, its sumptuous Rouge et Noir Triple Crème Brie beat France to win the gold medal at the World Cheese Awards in London (look for “World Champion Brie’’ on the label when selecting your cheese from the counter). Petaluma itself is a destination for cheese pilgrims of the highest level: Every spring, the area considered California’s cheese country hosts the state’s Artisan Cheese Festival, where attendees from all over the world come for cheese tastings, seminars, pairings, and demonstrations with prize-winning local and international producers. In town, the Petaluma Creamery, founded in 1913, was recently purchased by Larry Peter and reopened as part of his Spring Hill Jersey Cheese Co. Like Achadinha, Spring Hill is a farmstead creamery, meaning that it produces cheese from its own herds. In Spring Hill’s case, those are Jersey cows, which produce rich milk high in butterfat. The Spring Hill farm isn’t open for tours at this time, but visitors can visit the Petaluma Creamery store and sample a wide variety of cheeses, including Quark, ricotta, white cheddar, and Jack. Spring Hill also produces a line of specialty cheese products: fresh curds for homemade mozzarella; Gianna, a washed-rind cheese; and Spring Hill Breeze, a local interpretation of the classic French brie. The Creamery also serves old-fashioned milkshakes and fresh breads from neighboring Lombardi’s Bakery. Bonnie Tsui can be reached at www.bonnietsui.com. Tours and tastings by appointment, $5 per person. Tours of cheese factory daily; call ahead to confirm cheesemaking days and to reserve a spot. Spring Hill Cheese Co. and Petaluma Creamery 621 Western Ave.
Daily 10 a.m.-6 p.m. Local artisan cheeses and old-fashioned milkshakes. Culture, the country’s first cheese magazine (www.culturecheesemag.com), is the official publication of the festival.